March 13, 1970, Penza, RSFSR. In 1992 be graduated from Chernigov Higher Military Pilot School after Lenin’s Komsomol (HMPS). In 1998-2000 he studied at the Military Air Academy after Yu.A. Gagarin. Wife: Oksana Nikolaevna Samokutyaeva, born in 1972. Daughter: Anastasia Alexandrovna Samokutyaeva, born in 1995. Hero of the Russian Federation, Pilot-Cosmonaut of the Russian Federation. Decorated with Gold Star Medal of Hero of the Russian Federation, Medals For Distinguished Military Service First, Second and Third Classes, For Combat Heroism Second Class, Air Force Service Medal, departmental awards of Roscosmos. Cars, travelling, Canadian ice hockey. In 1992-1998 he served at Chernigov HMPS, helicopter school in the Ukraine, the Far East military district where be was assigned to a post of the squadron leader. By the enlistment in the detachment his total flight-hours are 680 hr. He made 250 parachute jumps. Mastered aircraft Vilga-35A, L-13, Blanik, L-39, Su-24M. Upon graduation from the Academy since 2000 he served at Yu.A. Gagarin Cosmonaut Training Center as the planning division head. On January 20, 2003 he got a positive medical comment (permission to special training) at the meeting of Chief Medical Board (CMB). On May 29, 2003 at the meeting of the Interdepartmental Commission for the cosmonaut selection he was enlisted in the cosmonaut detachment to pass a course of general space training. From June 16, 2003 he began general space training he finished on June 27, 2005 having passed graduation examinations with an excellent mark. On July 5, 2005 by decision of Interdepartmental Qualification Committee (IDQC) he was qualified as a test cosmonaut. In July 2008 it was reported that he was assigned to the backup crew for Expedition 25 to the ISS (ISS-25). At the meeting of the Chief Medical Board on February 10, 2009 he got permission to train within the Soyuz-TMA vehicle backup crew. 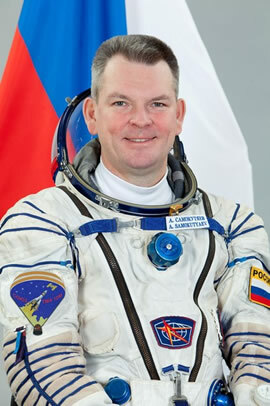 In October 2008 it was reported that he was assigned to the prime crew forf Expedition 27 to the ISS (ISS-27). On October 7, 2009 his assignment was confirmed by NASA (press release № 09-233). On March 11-12, 2010 at the Cosmonaut Training Center Samokutiaev together with Andrei Borisenko and NASA astronaut Scott Kelly passed preflight examinations with good and excellent marks. During the launch of Soyuz TMA-18 TV on April 2, 2010 he was a backup of the vehicle commander. At the meeting of the Interdepartmental Commission for the selection of cosmonauts and their assignment to the manned vehicles and stations crews on April 26, 2010 Samokutiaev was qualified as a cosmonaut of Yu.A. Gagarin CTC detachment. On March 4, 2011 at the Cosmonaut Training Center Aleksandr Samokutyaev together with Andrey Borisenko and Ronald Garan passed the preflight examination training on the ISS Russian Segment and on March 5, 2011 — on the Soyuz TMA simulator with an excellent mark. On March 11, 2011 by the Interdepartmental Commission at Gagarin Cosmonaut Training Center Samokutyaev was approved as commander of the prime crew of Soyuz TMA-21. On April 4, 2011 at the meeting of the State Commission at the Baikonur cosmodrome Aleksandr Samokutyaev was approved as commander of the prime crew of Soyuz TMA-21. He performed his first space flight from April 5 to September 16, 2011 as commander of Soyuz TMA-21 («Yuri Gagarin») and a flight engineer of ISS 27/28. In flight on August 3, 2011 he performed one extravehicular activity of the duration of 6 h 23 min. The mission duration was 164 days 5 h 50 min. In September 2012 Aleksandr Samokutyaev changed Dmitry Kondratiev as commander of the prime crew of Soyuz TMA under ISS-41/42 program (Elena Serova and Barry Wilmore were flight engineers). 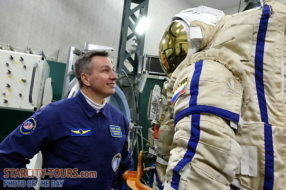 On January 16, 2013 by Order of Gagarin CTC Head he was assigned as Head of the cosmonaut candidates team. In January 2013 Aleksandr Samokutyaev together with Elena Serova and Barry Wilmore successfully passed training in the forest near Moscow for measures taken upon landing in the wooded/marshy locality in winter for 48 hours. From March 4, 2014 he passed training as commander of the ISS-39/40 backup crew together with flight engineers Elena Serova and Barry Wilmore. On March 4 the examination training on the Soyuz TMA simulator occurred. On March 5 the crew passed the test training on the ISS Russian Segment. On March 24, 2014 at the meeting of the State Commission at the Baikonur cosmodrome Samokutyaev was approved as commander of the Soyuz TMA-12M MTV backup crew. On March 26, 2014 at the Soyuz TMA-12M MTV launch he was a backup of the vehicle commander.